After high school, and a brief stint at University, Rick went on to attend the Institute of Audio Research in New York City, where he studied audio engineering and production. Upon graduation, Rick released two EP’s between 2011 and 2013 and was nominated for Top New Male Act by the New Jersey JAM Awards. In 2016, Rick packed his bags and relocated to Germany. 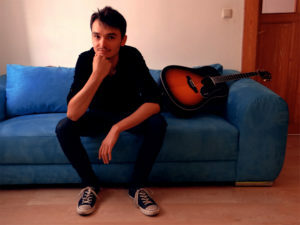 Over the course of the past two years, he has continued to redefine his sound, combining modern pop production techniques with nostalgic overdriven guitar. Writing catchy songs with heart and rousing listeners with his unique sonic palette, Rick Fewmore leaves a relevant, yet refreshing musical footprint.